This tour takes the participant on an insider's tour through Adelaide's Central Markets and features unknown local highlights such as hidden tunnels, visiting local potters and cheesery, with an education on wine to boot. Explore the Cultural Boulevard, walking amongst the statuesque Government and University buildings. Visit the famous Art Gallery with Rodin Sculptures and Museum with its unique desert garden. Visit Artlab to view the talented team restoring historic paintings, books and fabrics. Enjoy visits of little streets and lanes whilst indulging in a taste of fine chocolate from the famous icon producer Haighs. 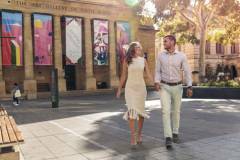 Visit SA's own Jurlique store, discovering hidden secrets along the way which only a local would know, wander past historic Queen Adelaide Club and Adelaide Club home to Adelaide's elite. The tour may end with a tasty lunch at SA's Art gallery. This tour takes in such quirky sites as the Cupola in honour of Elvis in the Botanic Gardens, experience a bush food trail and a visit to Ayers House Paxton's walk. The tour crosses Tandanya for an insight into contemporary Aboriginal art and the rainbow serpent. Then wander through the historic East End fruit and produce markets, Vardon place featuring art works such as sculptures and the interesting mud art work. Next stroll through charming arcades that take participants through to Rymill Park, home to the Garden of Unearthly delights. The tour may stop for a drink at PJ O'Brien's a famous Irish pub featuring interesting decor and views across to the WWI memorial to the Light Horseman. The East End of Rundle Street is undoubtly one of Adelaide's finest foodie streets and have the chance to stop in and enjoy a highlight of your fancy, be it a fresh oyster from the Oyster Bar or a hot indulgent chocolate from Cocolat. This tour focuses more on the contemporary Arts and culture of Adelaide. With highlights such as the Samstag Museum which has "heightened expectations" among Adelaide people. Other highlights nearby are the Jam Factory Craft and Design Centre and the long-established Experimental Art Foundation. Along the way see Artwoks tucked away and surprising art venues. Experience the interesting Dark Horsey bookshop featuring unique literature and discover some lesser known Australian gems. Amongst other highlights the tour may stop in to enjoy a drink and possibly a wine tasting in the stylish Apothocary. - There are 4 choices of theme walks available for this 2 hour Insiders Adelaide: Market Culture, Classic Adelaide - Culture and Heritage, East End Pub Culture and West End Art and Culture. Passengers need to advise which walk they are interested at time of booking. Departure point may vary depending on the tour chosen.